Historically speaking, ice-cream parlours were the first premises to take advantage of the Giemme System folding glass doors as an external shop window display. Even today they continue to choose them for their simplicity, practicality and elegance. GM Morando designs, manufactures and installs shop windows either directly in Lombardy (especially in the provinces of Milan, Monza and Brianza, Varese, Como, Lecco etc.) and in other regions with the help of national collaborators. "Gelateria Express" in the Corso Buenos Aires arcade in Milan chose the classic solution of a hinged entrance door with 3 folding leaf doors for both shop display windows without a floor guide rail. Instead "La Casa del Gelato" in Saronno, Varese, opted for a hinged entrance door with 5 folding glass doors that can be opened from both sides and with a recessed floor guide rail. 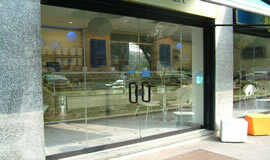 The ice-cream parlour "Imos” in Milan (Largo Zandonai) decided to enhance the entrance door of the shop by inserting 4 glass doors which open centrally. The 2 central doors are larger by dimension that the outer doors and are both equipped with handles. The remaining glass doors instead have the classic folding GIEMME SYSTEM side opening and can be opened or closed depending on the needs of the customers that occupy the tables in the room. "I Dolci di Ivan" in Arosio (Como) adopted another solution for its shop window displays: a hinged door with a fixed window and for the other side, fully opening folding glass doors which fold up towards the outside, hence not taking up much room. 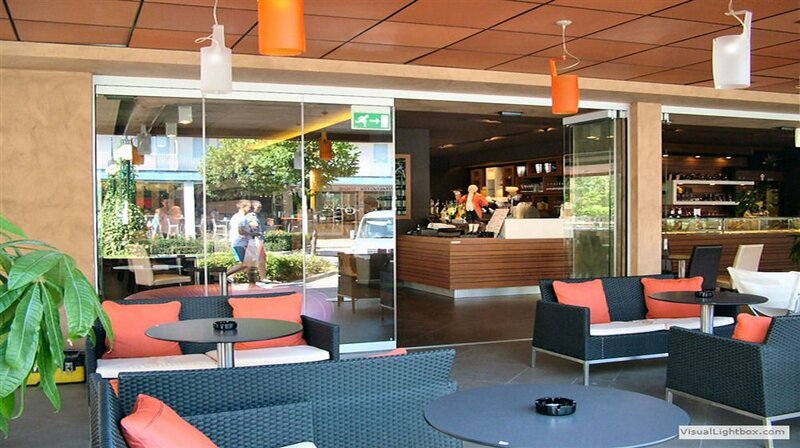 The GIEMME SYSTEM glass doors fit perfectly with any type of architecture as an external window for shops. At the same time, it allows you to take advantage of space that would otherwise only be used throughout the summer months. A striking example of this is at the Tabiano Bakery. 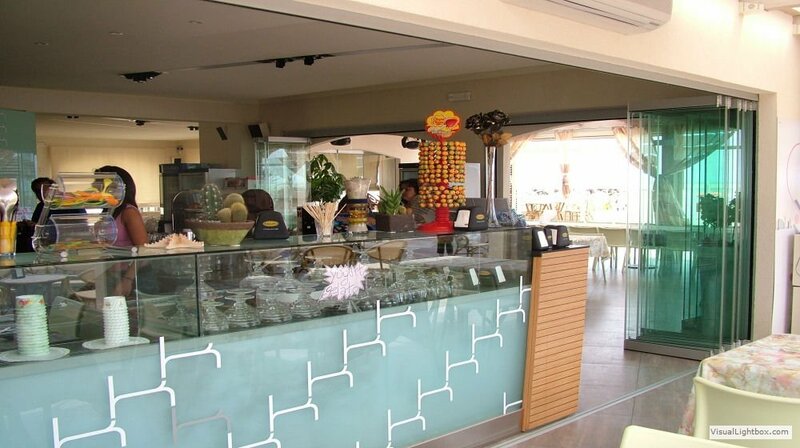 The fully opening GIEMME SYSTEM glass doors allow you to use removable outside counters for the sale of ice-cream, typical of seaside resorts or in fact wherever outside spaces permit. 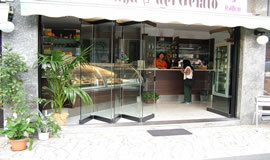 At Scaligeri , an ice-cream parlour in Sirmione, a display window was created above the ice-cream counter. This allows the management to have protection in the winter months. In fact, during this season the window will be closed but ice-cream can be served by means of an open leaf door. During the summer the display window will be opened to the maximum. 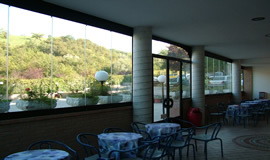 BiFolding doors near the sea, the doors slide near the desk (1cm). With a hinged entrance door. Doors fold up to the opposite side. Door fold up to the mounted side. Also available without floor guide rail up to a maximum of 4 doors. Entrance door with handle, lock and door closer. Can be opened internally or externally.